My older two try to make it their goal to get up before Daddy has left for work. There have even been a few times when one of them (or all of them) has burst out the front door in bare feet and pajamas to chase down Daddy’s car before he turns the corner and is out of sight. They eagerly wait for his lunchtime call, often locking themselves in their rooms to have a few moments of private conversation with him. And they eagerly wait by the window at the end of the day for him to return home from work. My kids love their daddy. They adore him! They want to do everything they can to be like him, including watching Star Wars (because that’s his favorite) and loving all things Christmas (because he does, too). They even fight over whose turn it is to go on a special Daddy/Daughter date or Dude’s Day Out (as my son calls his adventures). Their relationship with him is extra special because he is absolutely no blood relation to them at all. Not even a little bit. Yet he is the only man that they have ever known as “Daddy,” and he is the one they love. At this time of year, there is another adoptive father that I think about – one who really doesn’t get much attention at all. The first we even hear about Joseph, we see that he was a just man, one who followed the law. But he was also a kind man; and rather than have his wife publicly disgraced, he was simply going to divorce her quietly. “This is how the birth of Jesus the Messiah came about : His mother Mary was pledged to be married to Joseph, but before they came together, she was found to be pregnant through the Holy Spirit. 19 Because Joseph her husband was faithful to the law, and yet did not want to expose her to public disgrace, he had in mind to divorce her quietly” – Matt. 1:18-19. But then he had a dream. “But as he considered these things, behold, an angel of the Lord appeared to him in a dream, saying, ‘Joseph, son of David, do not fear to take Mary as your wife, for that which is conceived in her is from the Holy Spirit. 21 She will bear a son, and you shall call His name Jesus, for He will save His people from their sins'”- Matt. 1:20-21. I am sure that Joseph’s dreams for his life when he was younger did not involve public humiliation when people began to speculate how Mary got pregnant. I am sure that he probably dreamed of one day being a father and raising his children under the letter of the law. I am sure that he didn’t plan on traveling with a very expectant wife, unable to find a place for them to stay. We only see a few glimpses of Joseph. We know that he was kind. We know that he was a part of the Nativity story. We see him taking Jesus to the temple – both as a baby and as a boy. And we see him protecting his family from Pharaoh when the angel tells him in another dream to go. But can you imagine what it must have been like to be Jesus’ adopted father? Joseph’s entire world was interrupted by the birth of Someone else’s Son. And this Son wasn’t just a regular kid. Joseph knew. He knew that he was insufficient to be the adopted father of this boy. He knew that this was the Messiah that his law-abiding family and friends had been waiting for since the Garden of Eden. But he was called, and so he obeyed. “When Joseph woke up, he did what the angel of the Lord had commanded him. . .” – Matt. 1:24. 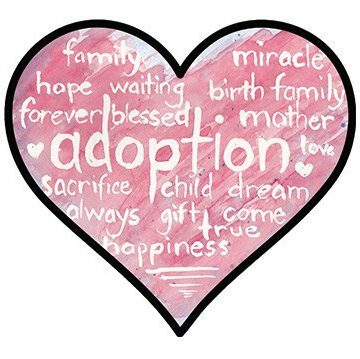 Here’s the thing about adoption. It’s not about having enough money. It’s not about being athletic. It’s not about having a big house. It’s not about having a fancy job. In fact, it’s not even about you. It’s about these children who need a father. It’s about taking care of the fatherless because that is what God has commanded. It’s about opening your heart and letting God work through you. It’s a calling, so we have to obey. Dads, there are kids out there who need you. They need a man who will love them, take them on “daddy dates,” work hard to provide for them, and return to them again at the end of the day. Joseph was just a simple carpenter. All he wanted to do was to obey the law and live a quiet life with his wife and children. But God had a bigger plan for him. God could have simply given a baby to Mary. He could have provided for her, taken care of her, protected her. And He did. He gave her Joseph. He called this man to be a father to His Son! I believe that Joseph is not mentioned very much because he was doing what dads do – supporting and loving his son behind the scenes, so his son could go on to be all that God wanted Him to be. His role was to not be in the spotlight. If you think that not every child needs a father, then look again at what God is saying about that right here in the story of His own Son! He didn’t leave Him fatherless here on earth, and He doesn’t want any child to be fatherless! I hear so many women say that they want to foster or adopt, but their husbands won’t agree to it. Come on, Guys! God is calling the fathers! He is calling you! There are too many children without fathers. Too many. So, Dad, what are you going to do to help these children? Is God calling you to be a father to the “fatherless”? For more information on fostering a child, visit http://www.heartgalleryofamerica.org or http://www.davethomasfoundation.org.